Hi! It's Jilly. 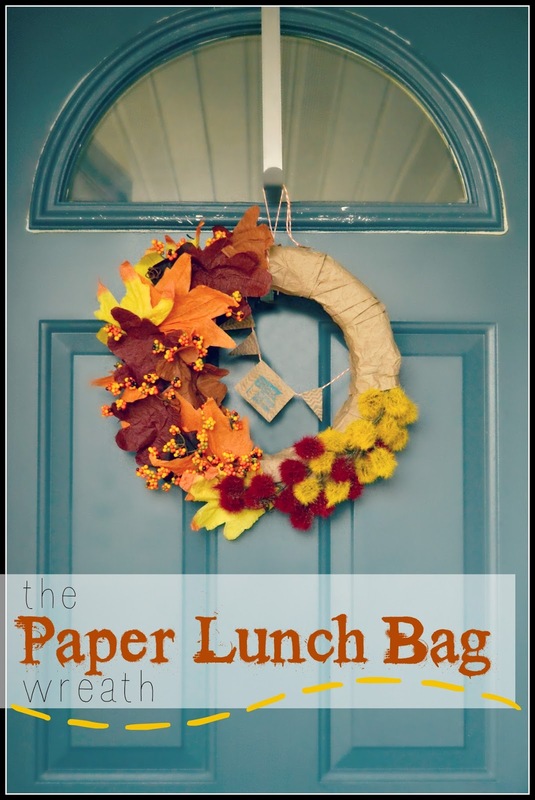 : The Paper Lunch Bag Wreath from Kim at Bugaboo, Mini, Mr, and Me. The Paper Lunch Bag Wreath from Kim at Bugaboo, Mini, Mr, and Me. Hi! It's Jilly. Our contributor today is a friend of mine from High School! Now we're all grown up and have blogs of our own! Well, "grown up" is all relative, right?! I can't wait for you to meet Kim and see the cute wreath she's whipped up for us! Hi! I'm Kimberly - the "me" over at bugaboo, mini, mr and me. 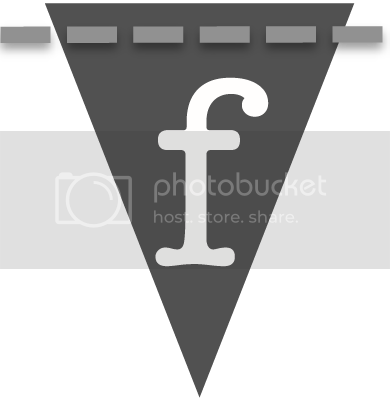 My blog is a peek into all my creative endeavors - successes and failures! 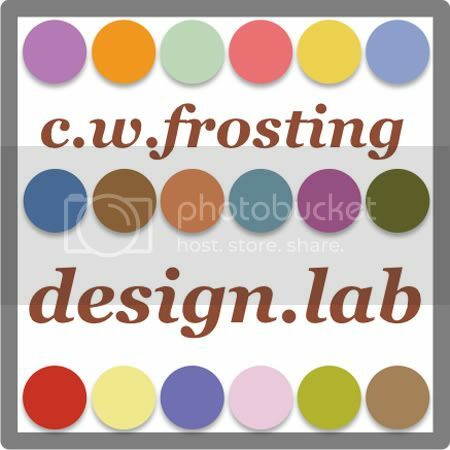 - and includes a little of everything: creating with kids, lots of different crafts, sewing, baking and cooking, some DIY/power tool type stuff, a little photography, and writing. I'm really excited to be here guest posting - and especially excited for the theme because it gave me a chance to make a little door decor, which I haven't done in a long time. I used to think that making wreaths was something old ladies did with plastic flowers and weird wicker baskets and such. I had zero interest in that type of "crafting." 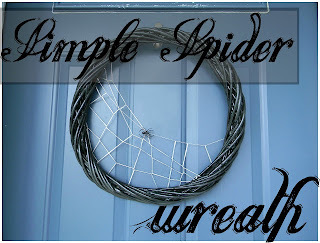 Once I started my blog and was looking for new ways to be unique and creative with my crafting, I realized you can make a wreath out of just about anything... And they've been some of my favorite creations ever since! Which, ironically, includes some fake floral stuff. Ha! 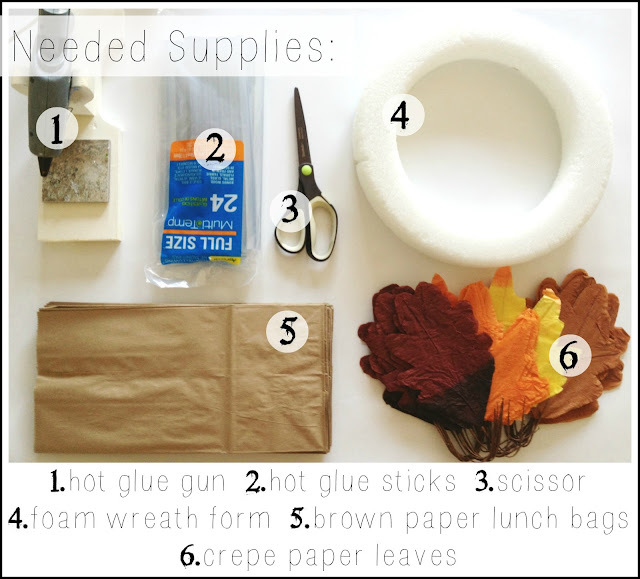 A note about supplies. 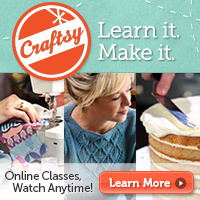 One thing I try hard to do is keep my crafting affordable. We're all on a budget right? So my number one tip for wreaths is to check out your local thrift stores for wreath forms. My local store usually has styrofoam and straw wreath forms regularly and they are $0.75!! Which is awesome compared to like $12 at Michael's. 1. Keeping the bag flat, use your scissors to cut across the top (where it's all jaggedy) and to cut the bottom off. 2. Slice the bag open down the middle seam on the back. 3. 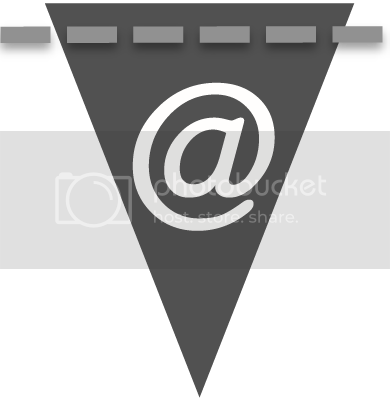 If you opened it up now, it would look like this. 4. Fold it all up on the folds and then fold it in half. 5. Cut it in three (somewhat) equal pieces. 6. Take each piece, open them up and then crumple them. 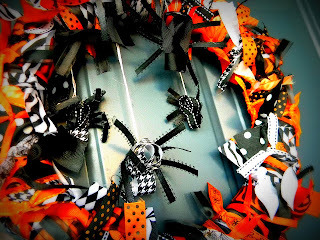 I needed three bags to cover my wreath form (9 strips), you may need a few more or less depending on the size of your form and how crumply you keep your strips when applying them. 1. Begin with your naked wreath form. Pick which side is the back and lay it backside up. 2. Put some hot glue right on the form. 3. Straighten out one of your paper bag strips slightly (leaving some of the folds and wrinkles as is) and smoosh it down into the hot glue. 4. 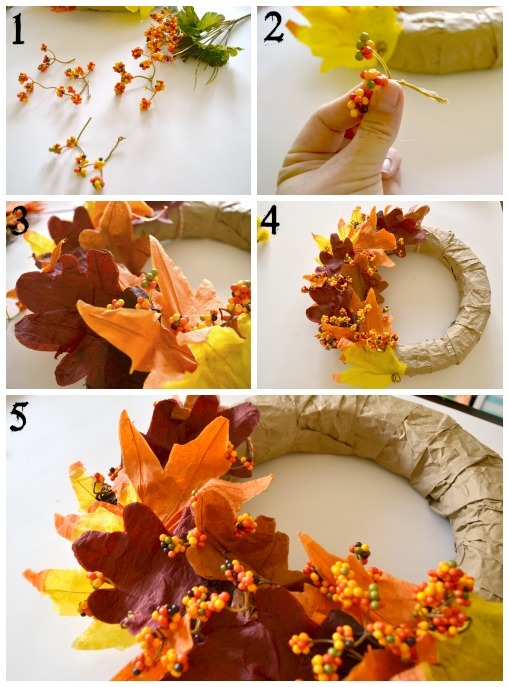 Wrap it around the front of the wreath, then tuck it under to the back. When you are wrapping, make sure to overlap the paper a little and also keep it rumply. 5. When you run out of strip, add a line of hot glue along the end. 6. 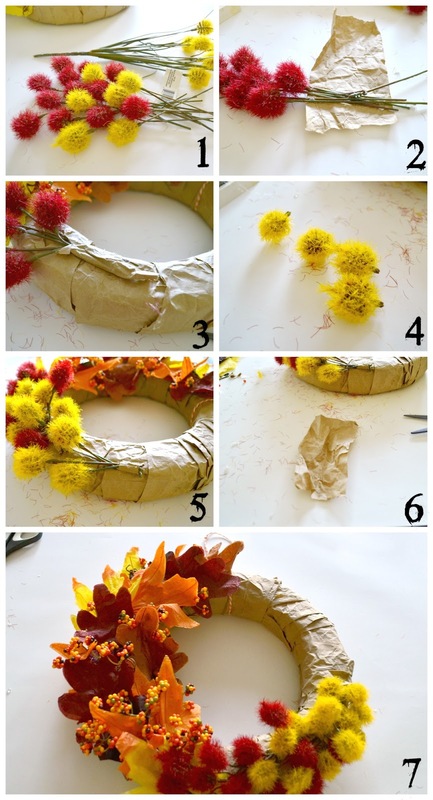 Push the paper strip down onto the wreath form. 7. Now, take a new strip and add a line of hot glue to one end. 8. Smoosh it down onto the wreath, overlapping the end of the last strip. Place it at a slight angle to help it lay flatter as you wrap. 9. Wrap and wrap until you run out. 10. Hot glue the end down. 11. Continue adding strips with hot glue, overlapping, crumpling and sometimes twisting and smooshing a bit, until the form is completely wrapped. 1. Begin with your wrapped wreath form. Again, you'll need to decide which is the front and which is the back. 2. Pick a leaf to start, put a little hot glue on the back. 3. Press it down onto the wreath, anywhere. Hold it there for a moment. 4. Voila! A leaf! Pull up the edges a bit. 5. The best part about these leaves is that they have wires for veins. So before you add them to the wreath, crumple them up a bit. Bend them and shape the edges. Most fall leaves aren't perfectly flat, are they? 6. Plus, you can curl the stem, which looks cooler than a long straight lame stem. 7. Put some hot glue on the back. 8. And add it to the wreath right next to the previous leaf. 9. You will want to overlap your leaves. Place them at different angles and in different spots along the wreath. Bend them into each other. Continue adding them and filling in holes until the leaves cover a little less than half of the form. 10. Tie a piece of twine in a loop. 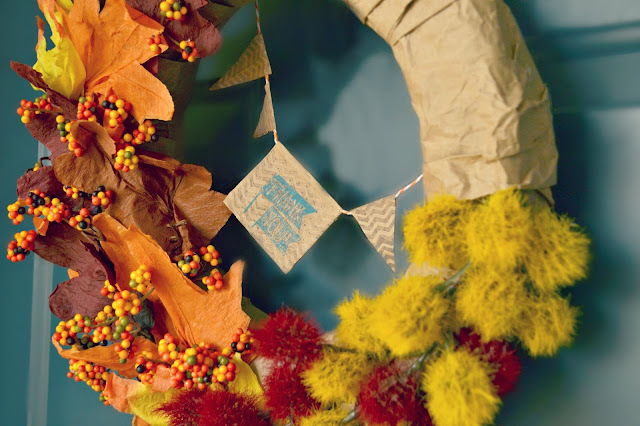 Place the loop under the wreath form. 11. Pull one end of the loop through the other end and tighten. Add a dab of hot glue to keep it in place. And then you can hang it! But, you could also keep going. 1. Take the little plastic balls and pull them off of the large stem so they are single stemmed and smaller, but still in little bunches. 2. Add hot glue along the stem. 3. Poke it down under a leaf. 4. I places mine at the intersections of leaves - where they overlapped - to hide the glue-y stems. 5. I also made them more concentrated at the bottom of the wreath, and more sparse toward the top. Again, you could stop here! 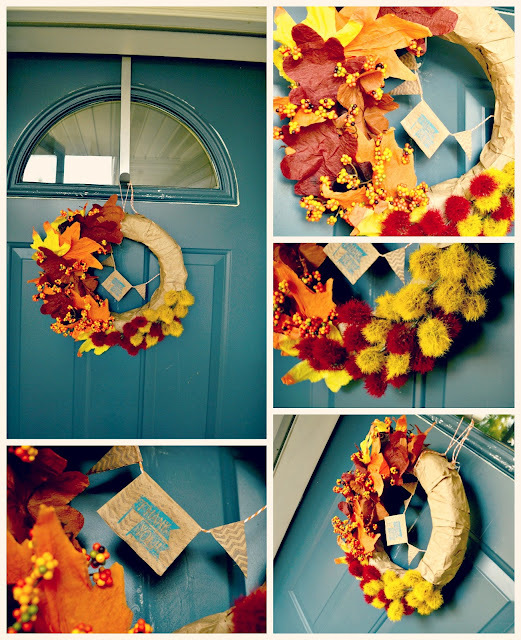 Another perfectly pretty wreath for your door! BUT. What about just a leeeeettle more? 1. 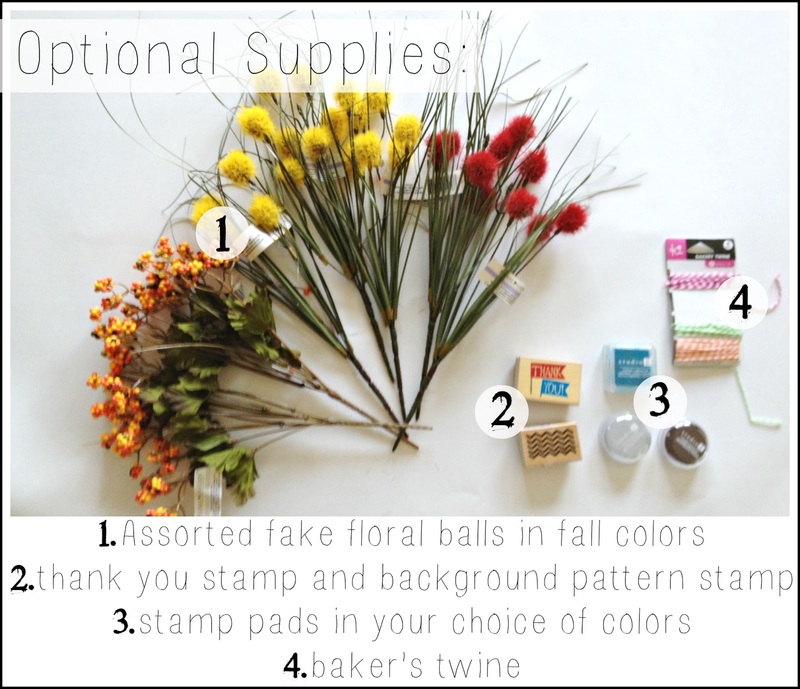 Cut your fuzzy ball flowers apart, leaving stems on each one. 2. Separate them into three piles, one for each color, and then a third pile for a mix of the two colors. Fan one of the piles out and shape it until you like it, place it on top of a scrap strip of paper bag, squirt hot glue on the stems and wrap the bag around the stems. This will keep the flowers together how you want them and hide the stems. 3. Trim the ends of the stems and attach the flowers to the bottom of the wreath (just barely overlapping the leaves) by hot gluing the paper wrapped part down. Repeat steps 2 and 3 for the mixed color pile. 4. Pull a few balls off of the last pile of flowers. Then repeat steps 2 and 3 again. 5. Once you've glued the paper wrapped stems down to the wreath, hot glue the single balls into any holes of empty spots. 6. Cut a small section of scrap paper bag and glue it over the last stems sticking out to hide them. And then you could stop. But if you're like me, you don't know when to stop. So why not shnazz it up some more? 1. Cut a piece of twine to fit across the inside of the wreath, with a little extra wiggle room to glue. 2. 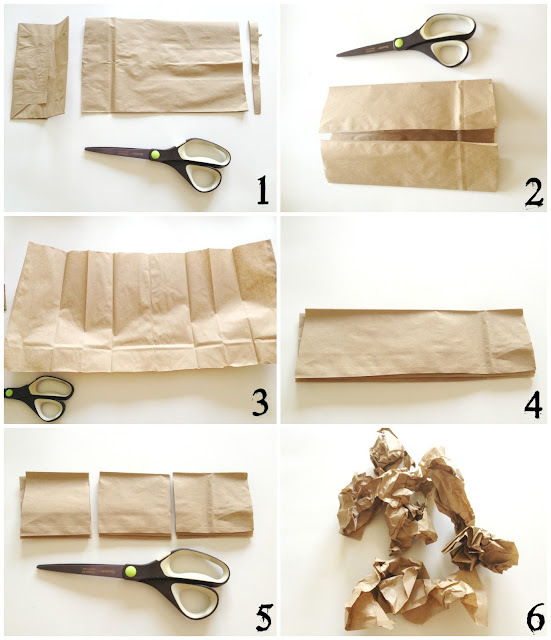 Fold a piece of scrap paper bag in half and cut out three triangles and a rectangle. 3. Use your "background pattern stamp" and a neutral color stamp pad to stamp a background on the pieces. Mine is brown chevron. 4. 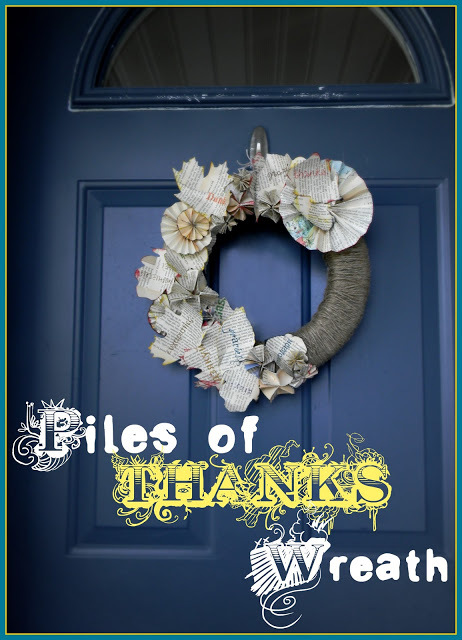 You can use whatever kind of quote or phrase you want for the rectangle piece, I went with Thank You, for a Thanksgiving-y theme. I used a bright contrasting turquoise so it would stand out. 5. 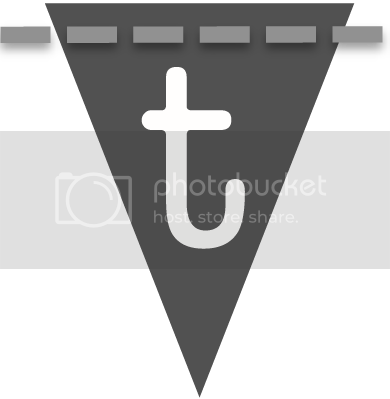 Open up your triangle, lay a line of hot glue down the middle. 7. and smoosh the triangle closed around the twine. 8. 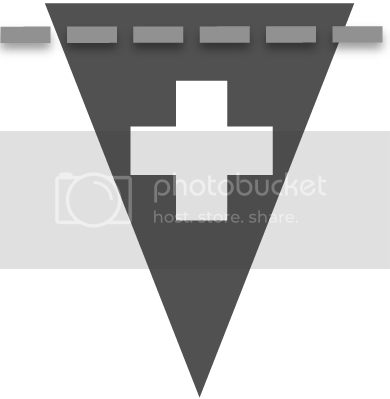 Repeat this for the other two triangles and the rectangle. 9. 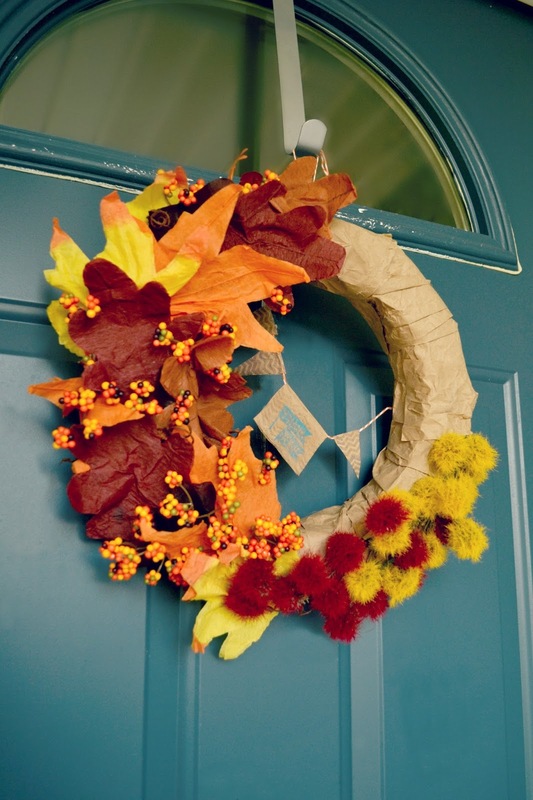 Turn your wreath over and glue the ends of the twine down to the wreath. 10. To hide the glue spots and make the twine extra secure, glue down a small square of paper bag over each end. 11. Turn your wreath over. Done! And because there's likely no more trends you could possibly add at this point without making it seem completely over the top, you're finished! 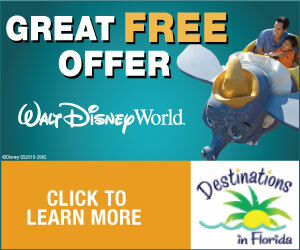 Just hang proudly on your front door and enjoy along with the nice cool fall weather! It's my favorite season - I think because of the colors. I love that this wreath illustrates that. OR, my "flavors of fall - dessert edition" which includes recipes for five different yummy fall desserts! Thanks for asking me over, Jillian! 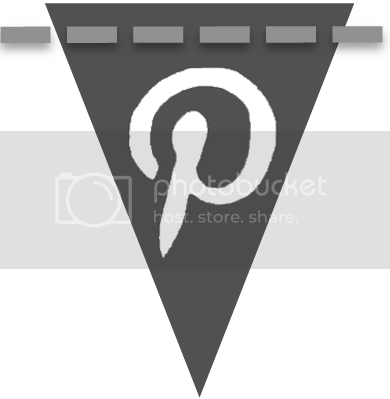 Hope to see you all at my blog, or you can find me on facebook and pinterest! Okay, how cute is that wreath?! Must. make. one. now. Thanks for the shopping tips, too. I never would have thought about getting wreaths from the thrift store! To check out the rest of our Fall In Love With Fall Series, click that little button below. So you don't miss the rest of the series, follow me on Facebook, Twitter, or Pinterest, or sign up for my newsletter and get each new post straight to your inbox!